Josh Macdonald is keen to play his part in Town’s promotion push after making his return from injury in the win over Alfreton on Saturday. 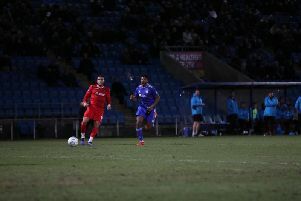 The winger’s previous appearance was as a substitute in the 0-0 draw at home to Stockport on January 28, after which he sustained a hamstring injury in training the following week. Having recovered from that, he sustained another hamstring injury in a behind-closed-doors friendly at Barnsley under 21s on February 25. “It couldn’t have been any worse because there was only a minute to go against Barnsley,” he said, “I went down the line and it just went completely. I think I came back too early. It was the same injury but twice as bad. That knocked me back - my most dangerous asset is my pace so it’s hard when you get a hamstring injury. “But I’ve not come back too early and it feels 100 per cent now so hopefully I can kick on and get back into the team. “It’s frustrating watching the lads playing, you just want to get back out there and help push the team towards the play-offs. “But you can’t rush back when it’s a hamstring injury because I’ve rushed back once and injured it even worse. Macdonald is yet to score in 34 appearances for Town this campaign, and is eager to rediscover his early season form after experiencing a dip in performances before he was sidelined. “I hit a bit of bad form but it wasn’t just me, the whole team didn’t perform,” he said. “I didn’t really get chance to get back into the team to turn my form around with me getting injured, so hopefully now I can get my confidence back. “When you’re a winger you’re relying on other people to get you the ball. I don’t want to make excuses because it’s down to me as well. Every time I got the ball I felt like I lacked a bit of confidence. Macdonald is optimistic about Town’s promotion chances ahead of Friday’s crunch clash at home to league leaders Fylde. “Good teams, if they’re not playing well, they still get points and that’s what we’ve done for a few games,” he said. “But I think it’s all clicking together now. “Fylde dropped points again on Saturday and we won so you never know, it could be tight towards the end. “The gaffer’s said the chance to finish top is still there. Fylde went to Stalybridge, who are down near the bottom of the table, expecting to win but they haven’t. “We need to keep going right until the end. Even if we finish in the play-offs we always seem to play better against the better teams so I think we’ll have a really good chance. “When you play against lesser teams they sit men behind the ball and it’s hard to break them down but when you play against the good teams they want to win as much as you.